Roosevelt Island Resident & Pianist Roy Eaton Plays Meditative Chopin & Joyful Joplin At Sunday Afternoon Concert - Will He Play Beefaroni Jingle Too? starting at 2:30 PM at the Church located at 543 Main Street. A sample of Mr. Eaton's work. Mr. Eaton was recently one of the subjects profiled in a NY Times article about the Sugar Hill neighborhood of Manhattan where many accomplished African Americans grew up as children. 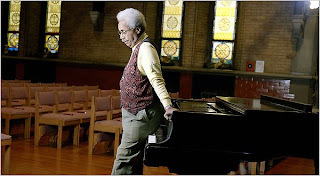 ... His growth as a pianist continued through college, though his concert career petered out after he served in the military during the Korean War. None of his accomplishments were unusual for him, he said, even if others thought they were. “I went through my life as if racial prejudice did not exist,” he said. 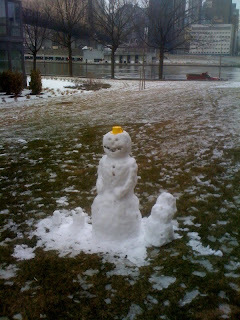 Now the father of 7-year old twins, he is reminded daily of his own early energy. The piano he learned on rests in the softly lighted sanctuary of the Episcopal church next door to his home on Roosevelt Island. In his apartment, the walls feature portraits of him in performance, as well as a quilt by his friend Faith, with women dancing around the George Washington Bridge. Great article. Read the whole thing. Due to the upcoming winter storm please be advised there will be no parking on Main Street from 6:00 P.M. today, February 5th to 9:00 A.M. Monday, February 8th. This rule is in effect to allow for the passage of emergency vehicles and snow removal. Some Southtown residents living in Roosevelt Island's Riverwalk buildings are not very happy with the lack of parking spaces close to their apartments. They complain of very few street parking spots and being too far from the Motorgate Parking garage for it to be convenient. ... Martinez is working with the Coler-Goldwater hospital to make some of the south campus employee parking available, which mostly benefits Southtown, Sportspark, and the tennis bubble. Has there been any update to the weekend parking situation on the Queens side of Goldwater Hospital. I could be wrong but I seem to recall you indicating that a discussion was going on with the Hospital that would let residents park there on weekends. Several Riverwalk residents have been asking me about this and wondering if they can park there on weekends. Mr. Shane replied by forwarding this statement from Roosevelt Island Public Safety Department Chief Keith Guerra. No. Permission for residents to park there has not been granted. I believe your last response was that folks park at their own risk. If we receive a complaint,PSD will enforce. Fyi. Not a clear statement, but it is what it is. 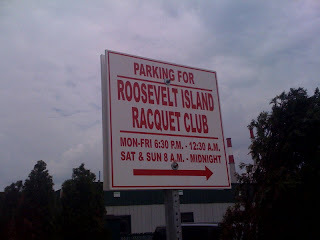 Some Riverwalk residents are also illegally parking in the grass lot across from the Commons Area and Bar that is supposed to be reserved for the Tennis Club patrons during the Tram outage but which has been used by the Tennis Club for the past year even though the Tram has been in operation. 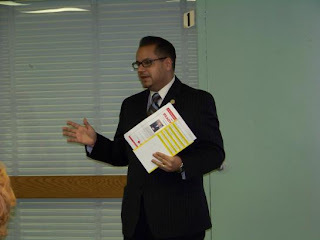 Roosevelt Island Operating Corporation (RIOC) President Steve Shane, Chief Financial Officer Steve Chironis and VP Of Operations Fernando Martinez were all busy last night making presentations to members of the Roosevelt Island community. The first up was Mr. Martinez. He was invited by Related Management to speak on the transportation changes planned for Roosevelt Island following the temporary shutdown of the Tram during it's Modernization Program. Mr. Martinez spoke before a gathering of Southtown's Riverwalk residents in the rooftop Party Room of Riverwalk Crossings, the new rental building adjacent to the Tram, at 405 Main Street. Mr. Martinez explained that the Tram shutdown is scheduled to begin on March 1, last for six months and resume operations in early September. There is a possibility that one of the cabins may be in operation a little earlier, middle of August, but that is not definite. During the tram shutdown, RIOC will be providing Red Bus Shuttle rush hour service to the Queens Plaza subway station every half hour with pick ups at Southtown and Gristedes stops. During non-rush hour week days and weekends, there will be Red Bus Shuttle service to Second Avenue in Manhattan. Here is more information on RIOC's plan for Red Bus shuttle service from earlier post. Mr. Martinez also talked about the results of the survey seeking residents interest in a temporary rush hour ferry service during the Tram Outage. The survey results were still being tabulated but of the approximately 1000 responses received, about 50% were in favor of the service and of those 50%, 30% (150) said they would pay the projected fare of $3 and find the route useful for their commute. The projected cost of the temporary ferry service is said by the Operator to be $5,000 per day. Do the math - even with a proposed $100,000 subsidy from RIOC - the economics don't seem to work unless RIOC (or some other entity) is willing to subsidize the service to a much larger dollar amount. Residents attending the meeting asked questions about increased F Train subway service during the tram outage and Mr. Martinez explained that RIOC has been meeting with the MTA but that no additional subway service is to be expected. More detail on the MTA's response to Roosevelt Island residents request for increased subway service is available from this earlier post. One new Roosevelt Island resident recounted a conversation she had with an MTA official about the problems she would encounter getting to her doctor with the Tram Outage. She was told by the MTA official that she should have done more research about Roosevelt Island before moving here. Other residents were concerned about the qualifications of POMA, the Tram Modernization contractor and whether all of the necessary construction and traffic permitting would be in place prior to the Tram going out of service. Mr. Martinez assured them that POMA was qualified and that all permits would be in place before the Tram was taken out of service. 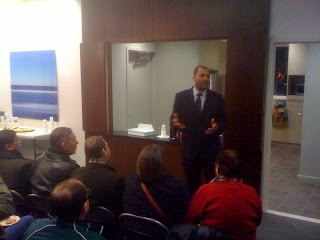 I think all agreed that Mr. Martinez made an excellent presentation. I asked if he has made similar presentations to other Roosevelt Island buildings and he reported that he has met with representatives from all of the Roosevelt Island buildings management but that Related was the only management company to ask him to speak to their residents. 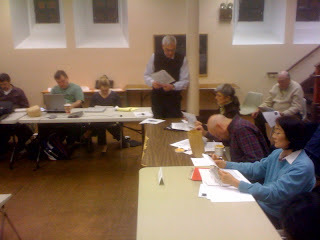 Later in the evening, Mr. Shane and Mr. Chironis appeared before the Roosevelt Island Residents Association (RIRA) Common Council to report on and take questions concerning RIOC's proposed budget for Fiscal Year 2010 -2011. Mr. Shane explained that RIOC is legally required to prepare a 5 year budget but that at the suggestion of RIRA has extended the forecast to 15 years and noted that such projections are subject to uncertainty, more so the further out in years one attempts to project. "Stuff happens" Mr. Shane said, which can change the assumptions upon which the budget is based. According to Mr. Shane, RIOC has an annual operating budget of $18-19 million with revenue coming from residential fees, ground rent, commercial retail rent, tramway, parking and other sources. No operating funds come from the City or State of New York. (See Page 5 of Budget for RIOC's revenue and expense projections). Mr. Chironis noted that to date, the recession has not adversely impacted RIOC's budget. Where the recession could hurt RIOC is in the capital budget because so much of that budget is based upon revenue coming from Hudson/Related completing Southtown with the construction of Riverwalk Buildings 7-9. If that does not happen then there could be big trouble for RIOC capital projects. 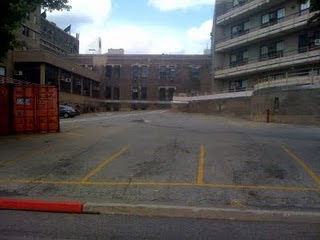 In 2006, the Southtown developers exersized an option at a cost of $2,000,000 to extend the Construction Commencement Date for all buildings of Southtown 5–9 from no later than December 31, 2010 to December 31, 2012. Management believes that given current market conditions there is a possibility that the development of Southtown 7, 8, and 9 may not happen, negatively affecting projected cash reserves. Below is the effect on projected cash reserves, if the development of Southtown 7, 8, and 9 were not to go forward. It is management's belief that if Southtown 7, 8, and 9 were to not proceed in the time period, there would be other subsequent development opportunities after the economic downturn cycle reverses its course. Both Mr. Shane and Mr. Chironis did equally as well as Mr. Martinez in their presentatins. Here is more information on RIOC Budget from earlier post. The Roosevelt Island Residents Association Town Hall Meeting scheduled for 8 PM on February 10 at the Good Shepherd Community Center will focus on RIOC's Budget as will RIOC's Town Hall meeting immediately following the February 18 RIOC Board of Directors meeting, also at the Good Shepherd Community Center. The RIOC Board will vote on the budget at their March meeting. We also learned from RIOC's presentation that, to date, there have been 64 condo units sold and 13 units in contract for the new 122 unit Hudson/Related Riverwalk Court building at 415 Main street as well as half of the units rented an the adjacent Riverwalk Crossings. Roosevelt Island PS/IS 217 PTA Question & Answer Information Session On 2/6 - Do You Know What Teachers Make? Interested in learning more about our local Island school? Please join us for an informational session, with parents of current PS/IS 217 students available to answer your questions and address your concerns. Also, on Monday February 8 at 8:45 AM, the first of three morning tours of the school will be conducted. Our daughter went to PS/IS 217 for pre-K and now goes to K. The school has great facilities. The staff is highly qualified. The class sizes are smaller than in most other public schools. The school offers in-class music & arts programs, and after school clubs (math, science, chess, drama, Spanish etc.) Cons: G&T program at PS/IS 217 is relatively new. Also, PS/IS 217 is very international. Students come from 60 countries, & many of them are children of United Nations employees, who learn English as a 2nd language = lower average academic scores. These families can move to another country at any time, so the classes are not as uniform or as stable as some people may like. Location is not ideal for Manhattan families. People complain about the PTA, but from my perspective it is very active this year. And the administration is open to all PTA initiatives. Lower grades parents asked for a foreign language program, and it only took 2 months for the school to get it set up. 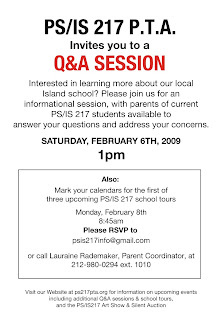 Here is the NYC Department of Education online portal for Roosevelt Island's PS/IS 217. Another source of information is this new blog - The Roosevelt Island School G & T Class Blog which also includes links to other class blogs. 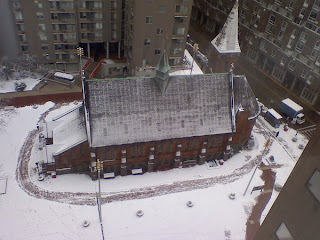 Good Shepherd Community Ctr on Roosevelt Island this snowy morning. Morning People. 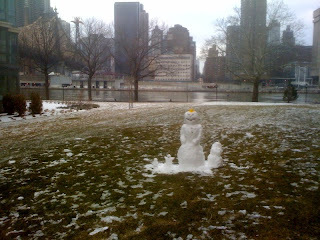 I woke up this morning looked outside and said Damn I love living on Roosevelt Island. It's really beautiful. made by Freda and her Mom. 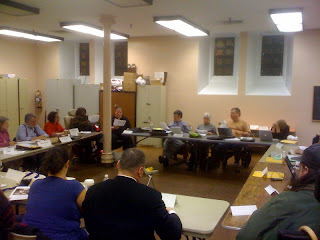 The Roosevelt Island Residents Association (RIRA) Common Council will be meeting tonight. 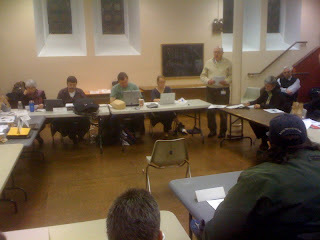 The RIRA Common Council is composed of residents elected from each of the Roosevelt Island buildings. If you are interested in learning what's going on here on Roosevelt Island - Come On Down! Prior to the start of the meeting there is an opportunity for the public to present any issues of concern to the Council. Have not received the Agenda yet but when I do will post it. UPDATE 2/6 - Never received the RIRA agenda but here's some of what happened. 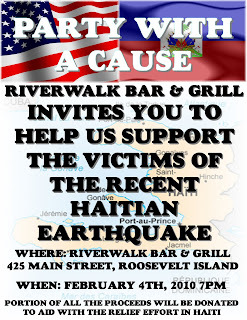 Roosevelt Island's Riverwalk Bar & Grill will be hosting a fundraiser for victims of the recent Haitian Earthquake. The fundraiser will take place at 425 Main Street on Thursday February 4 at 7 PM. All the money raised will be going to the Rotary Foundation's Haiti Earthquake Relief Fund. 100% of money earmarked goes directly to supplies and direct relief and rebuilding effort on the ground. We are very excited for the turnout with 100+ confirmed already coming from off island. Hopefully the residents and workers of Roosevelt Island will make a nice showing as well! Rotary clubs and districts worldwide are mobilizing resources to deliver urgently needed relief to the millions affected by Haiti's devastating earthquake. District 7020, which includes Haiti, has flown in 70 planes filled with more than 60,000 pounds of medical equipment and supplies into the cities of Pignon and Port-de-Paix to bypass logistical problems in the hard-hit capital of Port-au-Prince. ...ShelterBox has already delivered more than 3,300 containers to Haiti, with another 1,000 or more scheduled to be deployed. "This is the largest, quickest, and most complex deployment in our history," says John Leach, head of operations for ShelterBox. "We organized across four countries to get ShelterBoxes to the people of Haiti quickly." Each box contains a tent that houses 10 people as well as a stove, blankets, and other essential items. 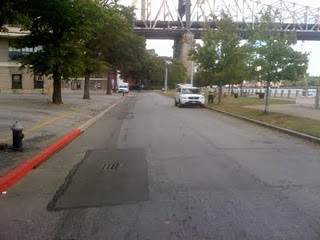 Roosevelt Island has many transportation concerns that can be alleviated through the use of technology. I have been exploring some new and interesting ways to make travel on and off the Island a more pleasant and efficient experience. The Roosevelt Island Operating Corporation (RIOC) has direct control over the Red Bus used regularly by almost every Islander. There have been many complaints about the reliability, the bunching that results in service gaps, the route, and the frequency. Some residents argue that we need a firm schedule; others respond that a schedule would increase reliability but reduce frequency. Both are correct. With increased frequency, you get increased maintenance and operating costs and an increased potential for bunching. With a schedule, you get fewer buses per hour. Some argue that the bus should be free, but the system costs about a million dollars a year, and there’s a deficit even with the present fare. Countdown clocks at the bus stops can help, too. The configuration of Main Street makes it difficult to see whether a bus is coming, but a clock can help you decide whether to wait or walk. Thanks to funding arranged by Assemblymember Micah Kellner, we should have such clocks soon. Tap cards, which are like EZ-Pass, can also help. Boarding, you pay by tapping your card on a terminal, even without taking it out of your purse or wallet. The system can be designed to alert the driver if someone passes without paying, so that both doors can be used for boarding. Ridership statistics pro- vided by such a system can help us apply for funding for further improvement of the overall system. Merchants can offer discounts for owners of these cards to increase patronage at their stores. Improving the Red Bus system is only a start. Once you’ve reached the Tram or subway station, you may find it hard to board. The MTA says we have enough trains per hour to accommodate our population. In its recent study, Columbia University agreed. But both noticed that trains are often late and, when the system slows down, there are not enough trains. The good news is that much of this is on its way to being fixed, but the bad news is that it’s going to take years. Signal systems on the F line are at least a half- century old, but are “newer” than on other lines. They won’t be upgraded anytime soon, but it is part of their capital plan. Most people need to get to work by about 9:00 a.m., which creates the morning jam that we call rush-hour. Twenty minutes earlier, the Manhattan platform is not yet a clogged mess, but getting people to leave a bit earlier is difficult without an incentive. Recognizing this, many cities use congestion pricing, charging more at peak travel times. Our new MTA chairman, Jay Walder, adopted this approach in London. Here, it can help spread the load, too. The MTA also noted that people wait in one small area of the subway platform rather then spreading out. Cars fill unevenly, and boarding is more difficult. Signs can advise passengers to move to the part of the platform served by cars that are less jammed. Commuters should also contact the managers of their stations about problems. 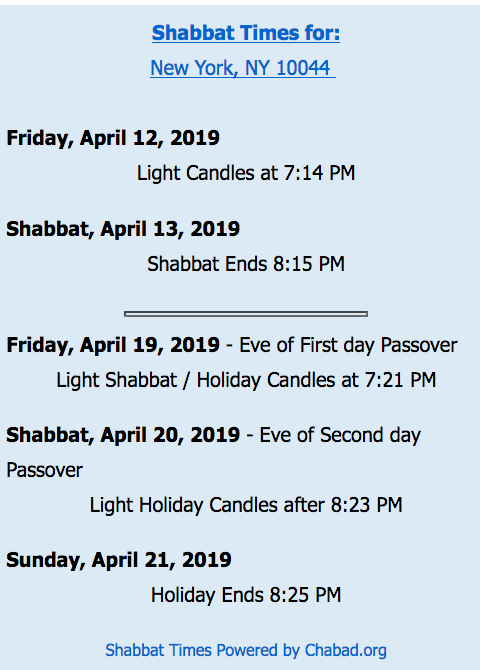 The necessary e-mail addresses are on the MTA website, and I’ve suggested posting them in the stations as well. When the MTA updates the current F train signal system, it may introduce countdown clocks on the platforms. Once they are in place, they can post other information, too. Information about elevator availability, for example, would help the disabled know in advance what problems they might encounter down the line. The disabled would also be helped by signs at wheelchair-eye-level (with the traditional blue and white colors for such signs), and signs showing the proper way to help a wheelchair passenger board (backward) would be helpful. And the MTA should mark the floors of the subway cars and the wheelchair loading area with signage to reserve space for wheelchair passengers. Partial funding and ideas should come from private industry and open-source (free) software com- petitions. The initial GPS Red Bus installations were funded by the developer of The Octagon. Verizon FIOS will provide the internet infrastructure that will power much of the technology discussed in this article. Subway screens can be designed with open- source software competitions, and can be supported with on-screen advertising. Private industry can innovate at a greater speed than government bureaucracy. Technology won’t solve all our transportation problems, but it can make our commute easier as the Island’s population grows. We were once at the forefront of technology in New York City, and there is no reason why we can’t lead again. More information here on how to contact the MTA's Subway Line Managers including the one for Roosevelt Island's F Train. Mr. Kalkin's report also appeared in the 1/30 Main Street WIRE as part of a series on the future of Roosevelt Island. Received the following message form State Senator Jose Serrano's office whose district includes Roosevelt Island. I am trying to spread the word that we are looking to hire two full time staff members for Senator Serrano's District Office. 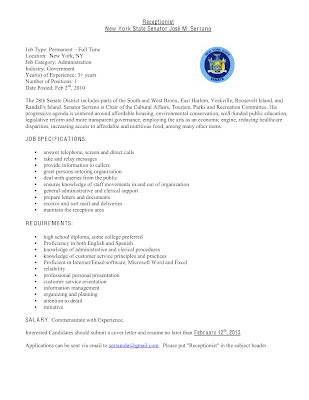 We are looking for a bilingual Receptionist and a Bilingual Junior Press Person. The postings are attached. Please help me spread the word to anyone you feel might be interested. 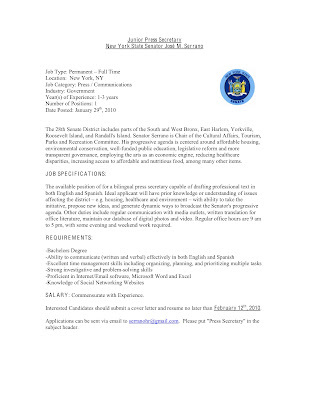 Click on images below for more information about these jobs with Senator Serrano. 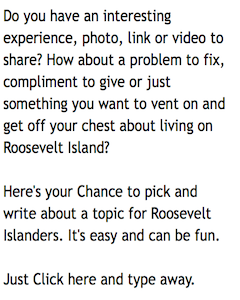 I understand that they would like to hire someone from Roosevelt Island. Gristedes Owner John Catsimatidis Promises Improvement At Roosevelt Island Gristedes Supermarket - Will It Happen? 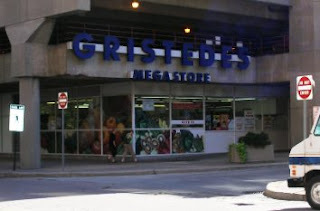 Gristedes has always been a major disappointment long before I moved to Roosevelt Island. Their stores are by far the most disgusting, confusing and over priced grocery stores in NYC. The only time I set foot into our Gristedes is when I really need something that I don't have at home or ran out of. Does Gristede's deliberately try to stock the worst possible produce that it can get? There's a reason why Fresh Direct chose Roosevelt Island as its pilot. If that store didn't get a fantastic break on the rent, it would have been out of business long ago. Well, things may be changing at the Roosevelt Island Gristedes. Gristedes: We met on site with John Catsimatidis, the owner, and his staff to discuss operations of the store. Gristedes has a new buying arrangement with Shoprite, both allegedly improving quality and reducing shelf price. We discussed a marketing plan by web site or otherwise as there is no easy medium for communicating to the specific buying public on the Island. Does everyone know that seniors get a 10% discount on Tuesdays? Revitalizing Gristedes would be good for everyone. Gristedes: We met on site with John Catsimatidis, the owner, and his staff to discuss operations of the store. An open letter to Island residents is published in this edition of the WIRE. If they come through with their promises, should be a benefit for everyone. Gristedes is very proud to have served and to continue to serve the residents of and visitors to Roosevelt Island for over 20 years. Gristedes takes its' role in the lives of the Roosevelt Island residents very seriously and makes every effort to ensure them successful shopping experience. If for any reason Gristedes does not live up to its' responsibility I would welcome the opportunity to take actions to correct the situation. 1. Gristedes has partnered with ShopRite and will be increasing the quantity and variety of ShopRite items carried in the store. 3. 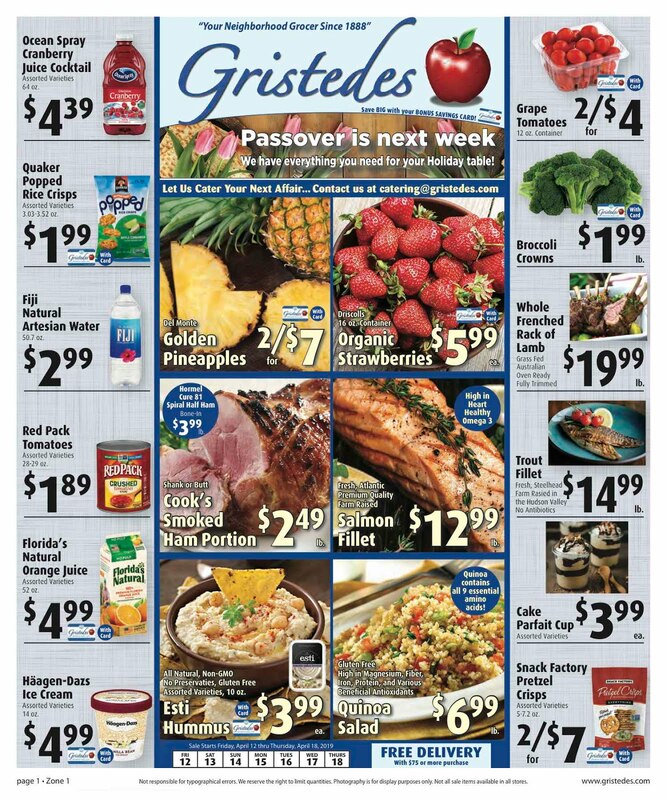 Gristedes offers two Senior Discount days, Tuesday and Wednesday. 10% discount to all Seniors. 4. Gristedes has expanded the Organic and Natural offering in all departments. 5. Gristedes has upgraded prepared foods and Grab 'n Go. 6. Gristedes accepts phone orders 212-371-2680. 8. Every item in the store is being removed from the shelves and checked for quality and proper dates. This will be accomplished by the end of February. 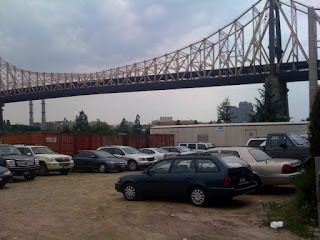 Let's see what happens and hope that the Roosevelt Island Gristedes does improve. 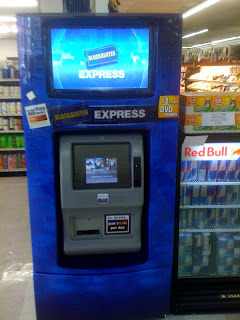 After all, they did install a $1 a night Blockbuster DVD rental kiosk. The comment, above, about the rent and the long lease, makes me wonder about the deal Gristede's has. According to RIOC's Proposed Fiscal Year 2010-11 budget ( Page 11), the Roosevelt Island Gristedes is located at 685 Main Street. It occupies 25,172 square feet and is paying an annual rent of $7 a square foot on a lease that terminates in 2032. For the 2011 budget year, Gristedes is paying an annual rent of $180,000 and is projected to pay 202,000 for the years 2012 -2016. On Wednesday, January 13, 2010 during the day tour (7 a.m. to 3 p.m.) PSD received a call of a past burglary. 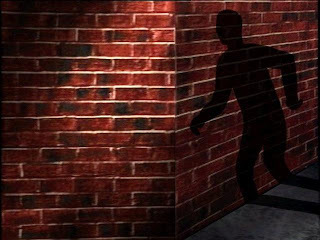 On Thursday, January 14, 2010 during the midnight tour (11 p.m. to 7 a.m.) PSD received a call regarding a male entering a building without permission. After a search of the building (name omitted for blog) was apprehended on the seventh floor and was identified as the aforementioned male. He was arrested for criminal trespass. A search of this subject revealed him to be in possession of a cell phone. A subsequent investigation proved the phone to be part of property taken during a burglary on January 13, 2010. While being processed at the 114th Precinct the NYPD Detectives were able to connect the subject to two additional burglaries. The subject is being charged with burglary, criminal possession of stolen property and criminal trespass. He was actually on parole and will probably have his parole violated. A job well done and a safer community for all thanks to the diligence and professionalism displayed by PSD. At the January RIRA meeting there was a report concerning allegations made by several taxi cab drivers that Public Safety Officers were using excessive force against them when being pulled over on the street including being punched and elbowed in the face. Do you have any comment on this allegation? I have not received one complaint from a Taxi Cab Driver claiming Excessive Force by any of the PSD Officers. However, on the contrary, two-thirds of the complaints we receive about motorists not obeying the Speed Limit, Street Signs or almost hitting pedestrians are made about Taxi & Livery Drivers that come onto the island. I have instructed the PSD Officers to strictly enforce the Vehicle and Traffic Laws, with special attention to these types of vehicles. When stopped, most respectfully state that they were not familiar with the Island's "Rules of the Road". There are some instances, however, where the Drivers show little-to-no respect for the Uniformed Officers that are trying to do their job. That is usually followed up by the Driver's failure to comply with a Lawful Order, and subsequently - an Arrest. Some residents would rather the Officers take the Verbal Abuse and Disrespect, and allow these Violators to be let go. The majority of the residents want these Violators dealt with, to insure a Safer Community. I choose to listen to those residents. Ellen Polivy and I met with Keith. He was forthcoming with the information pertaining to the incident. He had several check and balance systems to add credit to the officer's report. All the reports indicated that the officer's were disrespected, due to the ignorance of the driver of the cab, as to what authority they hold on R.I. We spoke about ways to diffuse this type of situation, maybe by initially explaining who they are and what power they hold on the Island, prior to asking for the driver's info. He seemed somewhat responsive to that. He also shared that the driver, once pepper sprayed and told he was going to be arrested, became compliant and wrote a statement that admitted he had been cursing at the officers, refusing their directions because he was unaware of their position on the Island. Keith felt that one should take into account the danger that Public Safety officer's face on any traffic stop, since they travel one per car, and that at any time a gun could be pulled out and they could be shot. This leads to a certain level of adrenaline. The officer's did admit that one of them also cursed at the taxi driver, telling him to get out of the F------ car, for which Keith reprimanded him and has additional trainings scheduled. It's good to see the improvement in lines of communication between the Public Safety Department and RIRA during the last year. I would to know which building the burglar entered and how he got into that building. I live in Westview, where many of my neighbors routinely open the door at 595 to let people they don't know into the building, rather than making them to walk to the door station at 625. I have always felt that this practice compromises the security of the building and refuse to do it. I know I'm viewed as a curmudgeon. Have you seen the video of President Barack Obama speaking to and answering questions from the Republican members of Congress? It is an intelligent, polite and at times, humorous exchange of views on subjects as important as Health Care Reform, Jobs Creation, Tax Policy and Bipartisanship without the usual bile and rancor which has characterized the debate so far. President Obama denied he was a Bolshevik, the Republicans denied they were obstructionists and both sides denied they were to blame for the toxic atmosphere clouding the nation’s political leadership. ... But at its core, if you look at the basic proposal that we've put forward: it has an exchange so that businesses and the self-employed can buy into a pool and can get bargaining power the same way big companies do; the insurance reforms that I've already discussed, making sure that there's choice and competition for those who don't have health insurance. The component parts of this thing are pretty similar to what Howard Baker, Bob Dole, and Tom Daschle proposed at the beginning of this debate last year. Now, you may not agree with Bob Dole and Howard Baker, and, certainly you don't agree with Tom Daschle on much, but that's not a radical bunch. But if you were to listen to the debate and, frankly, how some of you went after this bill, you'd think that this thing was some Bolshevik plot. No, I mean, that's how you guys -- (applause) -- that's how you guys presented it. And so I'm thinking to myself, well, how is it that a plan that is pretty centrist -- no, look, I mean, I'm just saying, I know you guys disagree, but if you look at the facts of this bill, most independent observers would say this is actually what many Republicans -- is similar to what many Republicans proposed to Bill Clinton when he was doing his debate on health care. So all I'm saying is, we've got to close the gap a little bit between the rhetoric and the reality. I'm not suggesting that we're going to agree on everything, whether it's on health care or energy or what have you, but if the way these issues are being presented by the Republicans is that this is some wild-eyed plot to impose huge government in every aspect of our lives, what happens is you guys then don't have a lot of room to negotiate with me. I mean, the fact of the matter is, is that many of you, if you voted with the administration on something, are politically vulnerable in your own base, in your own party. You've given yourselves very little room to work in a bipartisan fashion because what you've been telling your constituents is, this guy is doing all kinds of crazy stuff that's going to destroy America. Will this make any difference in how politics is practiced in Washington DC between the Democrats and Republican in the House and Senate? Probably not, but at least Obama is trying to show them how to do so. The full transcript of President Obama's dialogue with the Republican House members is below. The full video of the event is available at White House.gov. The NY Times fact checks the President and the Republicans. Part of the reason I accepted your invitation to come here was because I wanted to speak with all of you, and not just to all of you. So I'm looking forward to taking your questions and having a real conversation in a few moments. And I hope that the conversation we begin here doesn't end here; that we can continue our dialogue in the days ahead. It's important to me that we do so. It's important to you, I think, that we do so. But most importantly, it's important to the American people that we do so. I've said this before, but I'm a big believer not just in the value of a loyal opposition, but in its necessity. Having differences of opinion, having a real debate about matters of domestic policy and national security -- and that's not something that's only good for our country, it's absolutely essential. It's only through the process of disagreement and debate that bad ideas get tossed out and good ideas get refined and made better. And that kind of vigorous back and forth -- that imperfect but well-founded process, messy as it often is -- is at the heart of our democracy. That's what makes us the greatest nation in the world. So, yes, I want you to challenge my ideas, and I guarantee you that after reading this I may challenge a few of yours. (Laughter.) I want you to stand up for your beliefs, and knowing this caucus, I have no doubt that you will. I want us to have a constructive debate. The only thing I don't want -- and here I am listening to the American people, and I think they don't want either -- is for Washington to continue being so Washington-like. I know folks, when we're in town there, spend a lot of time reading the polls and looking at focus groups and interpreting which party has the upper hand in November and in 2012 and so on and so on and so on. That's their obsession. And I'm not a pundit. I'm just a President, so take it for what it's worth. But I don't believe that the American people want us to focus on our job security. They want us to focus on their job security. (Applause.) I don't think they want more gridlock. I don't think they want more partisanship. I don't think they want more obstruction. They didn't send us to Washington to fight each other in some sort of political steel-cage match to see who comes out alive. That's not what they want. They sent us to Washington to work together, to get things done, and to solve the problems that they're grappling with every single day. It's that same spirit of bipartisanship that made it possible for me to sign a defense contracting reform bill that was cosponsored by Senator McCain and members of Congress here today. We've stood together on behalf of our nation's veterans. Together we passed the largest increase in the VA's budget in more than 30 years and supported essential veterans' health care reforms to provide better access and medical care for those who serve in uniform. Some of you also joined Democrats in supporting a Credit Card Bill of Rights and in extending unemployment compensation to Americans who are out of work. Some of you joined us in stopping tobacco companies from targeting kids, expanding opportunities for young people to serve our country, and helping responsible homeowners stay in their homes. So we have a track record of working together. It is possible. But, as John, you mentioned, on some very big things, we've seen party-line votes that, I'm just going to be honest, were disappointing. Let's start with our efforts to jumpstart the economy last winter, when we were losing 700,000 jobs a month. Our financial system teetered on the brink of collapse and the threat of a second Great Depression loomed large. I didn't understand then, and I still don't understand, why we got opposition in this caucus for almost $300 billion in badly needed tax cuts for the American people, or COBRA coverage to help Americans who've lost jobs in this recession to keep the health insurance that they desperately needed, or opposition to putting Americans to work laying broadband and rebuilding roads and bridges and breaking ground on new construction projects. There was an interesting headline in CNN today: "Americans disapprove of stimulus, but like every policy in it." And there was a poll that showed that if you broke it down into its component parts, 80 percent approved of the tax cuts, 80 percent approved of the infrastructure, 80 percent approved of the assistance to the unemployed. Well, that's what the Recovery Act was. And let's face it, some of you have been at the ribbon-cuttings for some of these important projects in your communities. Now, I understand some of you had some philosophical differences perhaps on the just the concept of government spending, but, as I recall, opposition was declared before we had a chance to actually meet and exchange ideas. And I saw that as a missed opportunity. Now, I am happy to report this morning that we saw another sign that our economy is moving in the right direction. The latest GDP numbers show that our economy is growing by almost 6 percent -- that's the most since 2003. To put that in perspective, this time last year, we weren't seeing positive job growth; we were seeing the economy shrink by about 6 percent. So you've seen a 12 percent reversal during the course of this year. This turnaround is the biggest in nearly three decades -- and it didn't happen by accident. It happened -- as economists, conservative and liberal, will attest -- because of some of the steps that we took. And by the way, you mentioned a Web site out here, John -- if you want to look at what's going on, on the Recovery Act, you can look on recovery.gov -- a Web site, by the way, that was Eric Cantor's idea. Now, here's the point. These are serious times, and what's required by all of us -- Democrats and Republicans -- is to do what's right for our country, even if it's not always what's best for our politics. I know it may be heresy to say this, but there are things more important than good poll numbers. And on this no one can accuse me of not living by my principles. (Laughter.) A middle class that's back on its feet, an economy that lifts everybody up, an America that's ascendant in the world -- that's more important than winning an election. Our future shouldn't be shaped by what's best for our politics; our politics should be shaped by what's best for our future. But no matter what's happened in the past, the important thing for all of us is to move forward together. We have some issues right in front of us on which I believe we should agree, because as successful as we've been in spurring new economic growth, everybody understands that job growth has been lagging. Some of that's predictable. Every economist will say jobs are a lagging indicator, but that's no consolation for the folks who are out there suffering right now. And since 7 million Americans have lost their jobs in this recession, we've got to do everything we can to accelerate it. So, today, in line with what I stated at the State of the Union, I've proposed a new jobs tax credit for small business. And here's how it would work. Employers would get a tax credit of up to $5,000 for every employee they add in 2010. They'd get a tax break for increases in wages, as well. So, if you raise wages for employees making under $100,000, we'd refund part of your payroll tax for every dollar you increase those wages faster than inflation. It's a simple concept. It's easy to understand. It would cut taxes for more than 1 million small businesses. So I hope you join me. Let's get this done. I want to eliminate the capital gains tax for small business investment, and take some of the bailout money the Wall Street banks have returned and use it to help community banks start lending to small businesses again. So join me. I am confident that we can do this together for the American people. And there's nothing in that proposal that runs contrary to the ideological predispositions of this caucus. The question is: What's going to keep us from getting this done? I've proposed a modest fee on the nation's largest banks and financial institutions to fully recover for taxpayers' money that they provided to the financial sector when it was teetering on the brink of collapse. And it's designed to discourage them from taking reckless risks in the future. If you listen to the American people, John, they'll tell you they want their money back. Let's do this together, Republicans and Democrats. I propose that we close tax loopholes that reward companies for shipping American jobs overseas, and instead give companies greater incentive to create jobs right here at home -- right here at home. Surely, that's something that we can do together, Republicans and Democrats. We know that we've got a major fiscal challenge in reining in deficits that have been growing for a decade, and threaten our future. That's why I've proposed a three-year freeze in discretionary spending other than what we need for national security. That's something we should do together that's consistent with a lot of the talk both in Democratic caucuses and Republican caucuses. We can't blink when it's time to actually do the job. At this point, we know that the budget surpluses of the '90s occurred in part because of the pay-as-you-go law, which said that, well, you should pay as you go and live within our means, just like families do every day. Twenty-four of you voted for that, and I appreciate it. And we were able to pass it in the Senate yesterday. But the idea of a bipartisan fiscal commission to confront the deficits in the long term died in the Senate the other day. So I'm going to establish such a commission by executive order and I hope that you participate, fully and genuinely, in that effort, because if we're going to actually deal with our deficit and debt, everybody here knows that we're going to have to do it together, Republican and Democrat. No single party is going to make the tough choices involved on its own. It's going to require all of us doing what's right for the American people. And as I said in the State of the Union speech, there's not just a deficit of dollars in Washington, there is a deficit of trust. So I hope you'll support my proposal to make all congressional earmarks public before they come to a vote. And let's require lobbyists who exercise such influence to publicly disclose all their contacts on behalf of their clients, whether they are contacts with my administration or contacts with Congress. Let's do the people's business in the bright light of day, together, Republicans and Democrats. I know how bitter and contentious the issue of health insurance reform has become. And I will eagerly look at the ideas and better solutions on the health care front. If anyone here truly believes our health insurance system is working well for people, I respect your right to say so, but I just don't agree. And neither would millions of Americans with preexisting conditions who can't get coverage today or find out that they lose their insurance just as they're getting seriously ill. That's exactly when you need insurance. And for too many people, they're not getting it. I don't think a system is working when small businesses are gouged and 15,000 Americans are losing coverage every single day; when premiums have doubled and out-of-pocket costs have exploded and they're poised to do so again. I mean, to be fair, the status quo is working for the insurance industry, but it's not working for the American people. It's not working for our federal budget. It needs to change. This is a big problem, and all of us are called on to solve it. And that's why, from the start, I sought out and supported ideas from Republicans. I even talked about an issue that has been a holy grail for a lot of you, which was tort reform, and said that I'd be willing to work together as part of a comprehensive package to deal with it. I just didn't get a lot of nibbles. Creating a high-risk pool for uninsured folks with preexisting conditions, that wasn't my idea, it was Senator McCain's. And I supported it, and it got incorporated into our approach. Allowing insurance companies to sell coverage across state lines to add choice and competition and bring down costs for businesses and consumers -- that's an idea that some of you I suspect included in this better solutions; that's an idea that was incorporated into our package. And I support it, provided that we do it hand in hand with broader reforms that protect benefits and protect patients and protect the American people. A number of you have suggested creating pools where self-employed and small businesses could buy insurance. That was a good idea. I embraced it. Some of you supported efforts to provide insurance to children and let kids remain covered on their parents' insurance until they're 25 or 26. I supported that. That's part of our package. I supported a number of other ideas, from incentivizing wellness to creating an affordable catastrophic insurance option for young people that came from Republicans like Mike Enzi and Olympia Snowe in the Senate, and I'm sure from some of you as well. So when you say I ought to be willing to accept Republican ideas on health care, let's be clear: I have. Bipartisanship -- not for its own sake but to solve problems -- that's what our constituents, the American people, need from us right now. All of us then have a choice to make. We have to choose whether we're going to be politicians first or partners for progress; whether we're going to put success at the polls ahead of the lasting success we can achieve together for America. Just think about it for a while. We don't have to put it up for a vote today. Let me close by saying this. I was not elected by Democrats or Republicans, but by the American people. That's especially true because the fastest growing group of Americans are independents. That should tell us both something. I'm ready and eager to work with anyone who is willing to proceed in a spirit of goodwill. But understand, if we can't break free from partisan gridlock, if we can't move past a politics of "no," if resistance supplants constructive debate, I still have to meet my responsibilities as President. I've got to act for the greater good –- because that, too, is a commitment that I have made. And that's -- that, too, is what the American people sent me to Washington to do. So I am optimistic. I know many of you individually. And the irony, I think, of our political climate right now is that, compared to other countries, the differences between the two major parties on most issues is not as big as it's represented. But we've gotten caught up in the political game in a way that's just not healthy. It's dividing our country in ways that are preventing us from meeting the challenges of the 21st century. I'm hopeful that the conversation we have today can help reverse that. So thank you very much. Thank you, John. (Applause.) Now I'd like to open it up for questions. CONGRESSMAN PENCE: The President has agreed to take questions and members would be encouraged to raise your hand while you remain in your seat. (Laughter.) The chair will take the prerogative to make the first remarks. Mr. President, welcome back to the House Republican Conference. CONGRESSMAN PENCE: [Off microphone.] We are pleased to have you return. (Inaudible) a year ago -- House Republicans said then we would make you two promises. Number one, that most of the people in this room and their families would pray for you and your beautiful family just about every day for the next four years. And I want to assure you we're keeping that promise. THE PRESIDENT: I appreciate that. CONGRESSMAN PENCE: [off microphone] Number two, our pledge to you, Mr. President, was that door is always open. And we hope the (inaudible) of our invitation that we (inaudible). Mr. President, several of us in this conference yesterday on the way into Baltimore stopped by the Salvation Army homeless facility here in Baltimore. I met a little boy, an African American boy, in the 8th grade, named David Carter, Jr. When he heard that I would be seeing you today his eyes lit up like I had never seen. And I told him that if he wrote you a letter I'd give it to you, and I have. But I had a conversation with little David, Jr. and David, Sr. His family has been struggling with the economy. [On microphone.] His dad said words to me, Mr. President, that I'll never forget. About my age and he said -- he said, Congressman, it's not like it was when we were coming up. He said, there's just no jobs. Now, last year about the time you met with us, unemployment was 7.5 percent in this country. Your administration, and your party in Congress, told us that we'd have to borrow more than $700 billion to pay for a so-called stimulus bill. It was a piecemeal list of projects and boutique tax cuts, all of which was -- we were told -- had to be passed or unemployment would go to 8 percent, as your administration said. Well, unemployment is 10 percent now, as you well know, Mr. President; here in Baltimore it's considerably higher. Now, Republicans offered a stimulus bill at the same time. It cost half as much as the Democratic proposal in Congress, and using your economic analyst models, it would have created twice the jobs at half the cost. It essentially was across-the-board tax relief, Mr. President. Now we know you've come to Baltimore today and you've raised this tax credit, which was last promoted by President Jimmy Carter. But the first question I would pose to you, very respectfully, Mr. President, is would you be willing to consider embracing -- in the name of little David Carter, Jr. and his dad, in the name of every struggling family in this country -- the kind of across-the-board tax relief that Republicans have advocated, that President Kennedy advocated, that President Reagan advocated and that has always been the means of stimulating broad-based economic growth? THE PRESIDENT: Well, there was a lot packed into that question. (Laughter.) First of all, let me say I already promised that I'll be writing back to that young man and his family, and I appreciate you passing on the letter. THE PRESIDENT: But let's talk about just the jobs environment generally. You're absolutely right that when I was sworn in the hope was that unemployment would remain around 8 [percent], or in the 8 percent range. That was just based on the estimates made by both conservative and liberal economists, because at that point not all the data had trickled in. We had lost 650,000 jobs in December. I'm assuming you're not faulting my policies for that. We had lost, it turns out, 700,000 jobs in January, the month I was sworn in. I'm assuming it wasn't my administration's policies that accounted for that. We lost another 650,000 jobs the subsequent month, before any of my policies had gone into effect. So I'm assuming that wasn't as a consequence of our policies; that doesn't reflect the failure of the Recovery Act. The point being that what ended up happening was that the job losses from this recession proved to be much more severe -- in the first quarter of last year going into the second quarter of last year -- than anybody anticipated. So I mean, I think we can score political points on the basis of the fact that we underestimated how severe the job losses were going to be. But those job losses took place before any stimulus, whether it was the ones that you guys have proposed or the ones that we proposed, could have ever taken into effect. Now, that's just the fact, Mike, and I don't think anybody would dispute that. You could not find an economist who would dispute that. Now, at the same time, as I mentioned, most economists -- Republican and Democrat, liberal and conservative -- would say that had it not been for the stimulus package that we passed, things would be much worse. Now, they didn't fill a 7 million hole in the number of people who were unemployed. They probably account for about 2 million, which means we still have 5 million folks in there that we've still got to deal with. That's a lot of people. The package that we put together at the beginning of the year, the truth is, should have reflected -- and I believe reflected what most of you would say are common sense things. This notion that this was a radical package is just not true. A third of them were tax cuts, and they weren't -- when you say they were "boutique" tax cuts, Mike, 95 percent of working Americans got tax cuts, small businesses got tax cuts, large businesses got help in terms of their depreciation schedules. I mean, it was a pretty conventional list of tax cuts. A third of it was stabilizing state budgets. There is not a single person in here who, had it not been for what was in the stimulus package, wouldn't be going home to more teachers laid off, more firefighters laid off, more cops laid off. A big chunk of it was unemployment insurance and COBRA, just making sure that people had some floor beneath them, and, by the way, making sure that there was enough money in their pockets that businesses had some customers. You take those two things out, that accounts for the majority of the stimulus package. Are there people in this room who think that was a bad idea? A portion of it was dealing with the AMT, the alternative minimum tax -- not a proposal of mine; that's not a consequence of my policies that we have a tax system where we keep on putting off a potential tax hike that is embedded in the budget that we have to fix each year. That cost about $70 billion. And then the last portion of it was infrastructure which, as I said, a lot of you have gone to appear at ribbon-cuttings for the same projects that you voted against. Now, I say all this not to re-litigate the past, but it's simply to state that the component parts of the Recovery Act are consistent with what many of you say are important things to do -- rebuilding our infrastructure, tax cuts for families and businesses, and making sure that we were providing states and individuals some support when the roof was caving in. And the notion that I would somehow resist doing something that cost half as much but would produce twice as many jobs -- why would I resist that? I wouldn't. I mean, that's my point, is that -- I am not an ideologue. I'm not. It doesn't make sense if somebody could tell me you could do this cheaper and get increased results that I wouldn't say, great. The problem is, I couldn't find credible economists who would back up the claims that you just made. Now, we can -- here's what I know going forward, though. I mean, we're talking -- we were talking about the past. We can talk about this going forward. I have looked at every idea out there in terms of accelerating job growth to match the economic growth that's already taken place. The jobs credit that I'm discussing right now is one that a lot of people think would be the most cost-effective way for encouraging people to pick up their hiring. There may be other ideas that you guys have; I am happy to look at them and I'm happy to embrace them. I suspect I will embrace some of them. Some of them I've already embraced. But the question I think we're going to have to ask ourselves is, as we move forward, are we going to be examining each of these issues based on what's good for the country, what the evidence tells us, or are we going to be trying to position ourselves so that come November we're able to say, "The other party, it's their fault." If we take the latter approach then we're probably not going to get much agreement. If we take the former, I suspect there's going to be a lot of overlap. All right? Q Mr. President, will you consider supporting across-the-board tax relief, as President Kennedy did? THE PRESIDENT: Here's what I'm going to do, Mike. What I'm going to do is I'm going to take a look at what you guys are proposing. And the reason I say this, before you say, "Okay," I think is important to know -- what you may consider across-the-board tax cuts could be, for example, greater tax cuts for people who are making a billion dollars. I may not agree to a tax cut for Warren Buffet. You may be calling for an across-the-board tax cut for the banking industry right now. I may not agree to that. So I think that we've got to look at what specific proposals you're putting forward, and -- this is the last point I'll make -- if you're calling for just across-the-board tax cuts, and then on the other hand saying that we're somehow going to balance our budget, I'm going to want to take a look at your math and see how that works, because the issue of deficit and debt is another area where there has been a tendency for some inconsistent statements. How's that? All right? CONGRESSMAN RYAN: Thank you. Mr. President, first off, thanks for agreeing to accept our invitation here. It is a real pleasure and honor to have you with us here today. THE PRESIDENT: Good to see you. Is this your crew right here, by the way? CONGRESSMAN RYAN: It is. This is my daughter Liza, my son Charlie and Sam, and this is my wife Janna. CONGRESSMAN RYAN: Say hi, everybody. (Laughter.) I serve as a ranking member of the budget committee, so I'm going to talk a little budget if you don't mind. The spending bills that you've signed into law, the domestic discretionary spending has been increased by 84 percent. You now want to freeze spending at this elevated beginning next year. This means that total spending in your budget would grow at 3/100ths of 1 percent less than otherwise. I would simply submit that we could do more and start now. You've also said that you want to take a scalpel to the budget and go through it line by line. We want to give you that scalpel. I have a proposal with my home state senator, Russ Feingold, bipartisan proposal, to create a constitutional version of the line-item veto. (Applause.) Problem is, we can't even get a vote on the proposal. So my question is, why not start freezing spending now, and would you support a line-item veto in helping us get a vote on it in the House? THE PRESIDENT: Let me respond to the two specific questions, but I want to just push back a little bit on the underlying premise about us increasing spending by 84 percent. Now, look, I talked to Peter Orszag right before I came here, because I suspected I'd be hearing this -- I'd be hearing this argument. The fact of the matter is, is that most of the increases in this year's budget, this past year's budget, were not as a consequence of policies that we initiated but instead were built in as a consequence of the automatic stabilizers that kick in because of this enormous recession. So the increase in the budget for this past year was actually predicted before I was even sworn into office and had initiated any policies. Whoever was in there, Paul -- and I don't think you'll dispute that -- whoever was in there would have seen those same increases because of, on the one hand, huge drops in revenue, but at the same time people were hurting and needed help. And a lot of these things happened automatically. Now, the reason that I'm not proposing the discretionary freeze take into effect this year -- we prepared a budget for 2010, it's now going forward -- is, again, I am just listening to the consensus among people who know the economy best. And what they will say is that if you either increase taxes or significantly lowered spending when the economy remains somewhat fragile, that that would have a destimulative effect and potentially you'd see a lot of folks losing business, more folks potentially losing jobs. That would be a mistake when the economy has not fully taken off. That's why I've proposed to do it for the next fiscal year. So that's point number two. With respect to the line-item veto, I actually -- I think there's not a President out there that wouldn't love to have it. And I think that this is an area where we can have a serious conversation. I know it is a bipartisan proposal by you and Russ Feingold. I don't like being held up with big bills that have stuff in them that are wasteful but I've got to sign because it's a defense authorization bill and I've got to make sure that our troops are getting the funding that they need. I will tell you, I would love for Congress itself to show discipline on both sides of the aisle. I think one thing that you have to acknowledge, Paul, because you study this stuff and take it pretty seriously, that the earmarks problem is not unique to one party and you end up getting a lot of pushback when you start going after specific projects of any one of you in your districts, because wasteful spending is usually spent somehow outside of your district. Have you noticed that? The spending in your district tends to seem pretty sensible. So I would love to see more restraint within Congress. I'd like to work on the earmarks reforms that I mentioned in terms of putting earmarks online, because I think sunshine is the best disinfectant. But I am willing to have a serious conversation on the line-item veto issue. CONGRESSMAN RYAN: I'd like to walk you through that, because we have a version we think is constitutional. THE PRESIDENT: Let me take a look at it. CONGRESSMAN RYAN: I would simply say that automatic stabilizer spending is mandatory spending. The discretionary spending, the bills that Congress signs that you sign into law, that has increased 84 percent. THE PRESIDENT: We'll have a longer debate on the budget numbers, all right? CONGRESSMAN PENCE: Shelley Moore Capito, West Virginia. CONGRESSWOMAN CAPITO: Thank you, Mr. President, for joining us here today. As you said in the State of the Union address on Wednesday, jobs and the economy are number one. And I think everyone in this room, certainly I, agree with you on that. I represent the state of West Virginia. We're resource-rich. We have a lot of coal and a lot of natural gas. But our -- my miners and the folks who are working and those who are unemployed are very concerned about some of your policies in these areas: cap and trade, an aggressive EPA, and the looming prospect of higher taxes. In our minds, these are job-killing policies. So I'm asking you if you would be willing to re-look at some of these policies, with a high unemployment and the unsure economy that we have now, to assure West Virginians that you're listening. THE PRESIDENT: Look, I listen all the time, including to your governor, who's somebody who I enjoyed working with a lot before the campaign and now that I'm President. And I know that West Virginia struggles with unemployment, and I know how important coal is to West Virginia and a lot of the natural resources there. That's part of the reason why I've said that we need a comprehensive energy policy that sets us up for a long-term future. For example, nobody has been a bigger promoter of clean coal technology than I am. Testament to that, I ended up being in a whole bunch of advertisements that you guys saw all the time about investing in ways for us to burn coal more cleanly. I've said that I'm a promoter of nuclear energy, something that I think over the last three decades has been subject to a lot of partisan wrangling and ideological wrangling. I don't think it makes sense. I think that that has to be part of our energy mix. I've said that I am supportive -- and I said this two nights ago at the State of the Union -- that I am in favor of increased production. So if you look at the ideas that this caucus has, again with respect to energy, I'm for a lot of what you said you are for. The one thing that I've also said, though, and here we have a serious disagreement and my hope is we can work through these disagreements -- there's going to be an effort on the Senate side to do so on a bipartisan basis -- is that we have to plan for the future. And the future is that clean energy -- cleaner forms of energy are going to be increasingly important, because even if folks are still skeptical in some cases about climate change in our politics and in Congress, the world is not skeptical about it. If we're going to be after some of these big markets, they're going to be looking to see, is the United States the one that's developing clean coal technology? Is the United States developing our natural gas resources in the most effective way? Is the United States the one that is going to lead in electric cars? Because if we're not leading, those other countries are going to be leading. So what I want to do is work with West Virginia to figure out how we can seize that future. But to do that, that means there's going to have to be some transition. We can't operate the coal industry in the United States as if we're still in the 1920s or the 1930s or the 1950s. We've got to be thinking what does that industry look like in the next hundred years. And it's going to be different. And that means there's going to be some transition. And that's where I think a well-thought-through policy of incentivizing the new while recognizing that there's going to be a transition process -- and we're not just suddenly putting the old out of business right away -- that has to be something that both Republicans and Democrats should be able to embrace. CONGRESSMAN PENCE: Jason Chaffetz, Utah. CONGRESSMAN CHAFFETZ: Thank you, Mr. President. It's truly an honor. THE PRESIDENT: Great to be here. CONGRESSMAN CHAFFETZ: And I appreciate you being here. I'm one of 22 House freshmen. We didn't create this mess, but we are here to help clean it up. You talked a lot about this deficit of trust. There's some things that have happened that I would appreciate your perspective on, because I can look you in the eye and tell you we have not been obstructionists. Democrats have the House and Senate and the presidency. And when you stood up before the American people multiple times and said you would broadcast the health care debates on C-SPAN, you didn't. And I was disappointed, and I think a lot of Americans were disappointed. You said you weren't going to allow lobbyists in the senior-most positions within your administration, and yet you did. I applauded you when you said it -- and disappointed when you didn't. You said you'd go line by line through the health care debate -- or through the health care bill. And there were six of us, including Dr. Phil Roe, who sent you a letter and said, "We would like to take you up on the offer; we'd like to come." We never heard a letter, we never got a call. We were never involved in any of those discussions. And when you said in the House of Representatives that you were going to tackle earmarks -- in fact, you didn't want to have any earmarks in any of your bills -- I jumped up out of my seat and applauded you. But it didn't happen. CONGRESSMAN CHAFFETZ: -- I would certainly appreciate it. THE PRESIDENT: That was a long list, so -- (laughter) -- let me respond. Look, the truth of the matter is that if you look at the health care process -- just over the course of the year -- overwhelmingly the majority of it actually was on C-SPAN, because it was taking place in congressional hearings in which you guys were participating. I mean, how many committees were there that helped to shape this bill? Countless hearings took place. 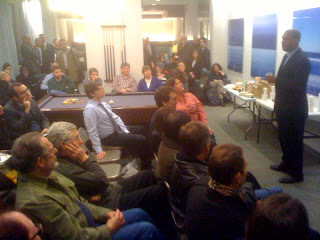 Now, I kicked it off, by the way, with a meeting with many of you, including your key leadership. What is true, there's no doubt about it, is that once it got through the committee process and there were now a series of meetings taking place all over the Capitol trying to figure out how to get the thing together -- that was a messy process. And I take responsibility for not having structured it in a way where it was all taking place in one place that could be filmed. How to do that logistically would not have been as easy as it sounds, because you're shuttling back and forth between the House, the Senate, different offices, et cetera, different legislators. But I think it's a legitimate criticism. So on that one, I take responsibility. With respect to earmarks, we didn't have earmarks in the Recovery Act. We didn't get a lot of credit for it, but there were no earmarks in that. I was confronted at the beginning of my term with an omnibus package that did have a lot of earmarks from Republicans and Democrats, and a lot of people in this chamber. And the question was whether I was going to have a big budget fight, at a time when I was still trying to figure out whether or not the financial system was melting down and we had to make a whole bunch of emergency decisions about the economy. So what I said was let's keep them to a minimum, but I couldn't excise them all. Now, the challenge I guess I would have for you as a freshman, is what are you doing inside your caucus to make sure that I'm not the only guy who is responsible for this stuff, so that we're working together, because this is going to be a process? When we talk about earmarks, I think all of us are willing to acknowledge that some of them are perfectly defensible, good projects; it's just they haven't gone through the regular appropriations process in the full light of day. So one place to start is to make sure that they are at least transparent, that everybody knows what's there before we move forward. In terms of lobbyists, I can stand here unequivocally and say that there has not been an administration who was tougher on making sure that lobbyists weren't participating in the administration than any administration that's come before us. Now, what we did was, if there were lobbyists who were on boards and commissions that were carryovers and their term hadn't been completed, we didn't kick them off. We simply said that moving forward any time a new slot opens, they're being replaced. So we've actually been very consistent in making sure that we are eliminating the impact of lobbyists, day in, day out, on how this administration operates. There have been a handful of waivers where somebody is highly skilled -- for example, a doctor who ran Tobacco-Free Kids technically is a registered lobbyist; on the other end, has more experience than anybody in figuring out how kids don't get hooked on cigarettes. So there have been a couple of instances like that, but generally we've been very consistent on that front. CONGRESSMAN PENCE: Marsha Blackburn, Tennessee. CONGRESSMAN BLACKBURN: Thank you, Mr. President, and thank you for acknowledging that we have ideas on health care because, indeed, we do have ideas, we have plans, we have over 50 bills, we have lots of amendments that would bring health care ideas to the forefront. We would -- we've got plans to lower cost, to change purchasing models, address medical liability, insurance accountability, chronic and preexisting conditions, and access to affordable care for those with those conditions, insurance portability, expanded access -- but not doing it with creating more government, more bureaucracy, and more cost for the American taxpayer. And we look forward to sharing those ideas with you. We want to work with you on health reform and making certain that we do it in an affordable, cost-effective way that is going to reduce bureaucracy, reduce government interference, and reduce costs to individuals and to taxpayers. And if those good ideas aren't making it to you, maybe it's the House Democrat leadership that is an impediment instead of a conduit. But we're concerned also that there are some lessons learned from public option health care plans that maybe are not being heeded. And certainly in my state of Tennessee, we were the test case for public option health care in 1994, and our Democrat government has even cautioned that maybe our experiences there would provide some lessons learned that should be heeded, and would provide guidance for us to go forward. And as you said, what we should be doing is tossing old ideas out, bad ideas out, and moving forward in refining good ideas. And certainly we would welcome that opportunity. THE PRESIDENT: Actually, I've gotten many of your ideas. I've taken a look at them, even before I was handed this. Some of the ideas we have embraced in our package. Some of them are embraced with caveats. So let me give you an example. I think one of the proposals that has been focused on by the Republicans as a way to reduce costs is allowing insurance companies to sell across state lines. We actually include that as part of our approach. But the caveat is, we've got to do so with some minimum standards, because otherwise what happens is that you could have insurance companies circumvent a whole bunch of state regulations about basic benefits or what have you, making sure that a woman is able to get mammograms as part of preventive care, for example. Part of what could happen is insurance companies could go into states and cherry-pick and just get those who are healthiest and leave behind those who are least healthy, which would raise everybody's premiums who weren't healthy, right? So it's not that many of these ideas aren't workable, but we have to refine them to make sure that they don't just end up worsening the situation for folks rather than making it better. Now, what I said at the State of the Union is what I still believe: If you can show me -- and if I get confirmation from health care experts, people who know the system and how it works, including doctors and nurses -- ways of reducing people's premiums; covering those who do not have insurance; making it more affordable for small businesses; having insurance reforms that ensure people have insurance even when they've got preexisting conditions, that their coverage is not dropped just because they're sick, that young people right out of college or as they're entering in the workforce can still get health insurance -- if those component parts are things that you care about and want to do, I'm game. And I've got -- and I've got a lot of these ideas. And so we were in the process of scrubbing this and making sure that it's tight. But at its core, if you look at the basic proposal that we've put forward: it has an exchange so that businesses and the self-employed can buy into a pool and can get bargaining power the same way big companies do; the insurance reforms that I've already discussed, making sure that there's choice and competition for those who don't have health insurance. The component parts of this thing are pretty similar to what Howard Baker, Bob Dole, and Tom Daschle proposed at the beginning of this debate last year. And I would just say that we have to think about tone. It's not just on your side, by the way -- it's on our side, as well. This is part of what's happened in our politics, where we demonize the other side so much that when it comes to actually getting things done, it becomes tough to do. CONGRESSMAN PENCE: Dr. Tom Price from Georgia, and then we'll have one more after that if your time permits, Mr. President. CONGRESSMAN PENCE: So are we. THE PRESIDENT: I don't think I said that. What I said was, within the context of health care -- I remember that speech pretty well, it was only two days ago -- (laughter) -- I said I welcome ideas that you might provide. I didn't say that you haven't provided ideas. I said I welcome those ideas that you'll provide. CONGRESSMAN PRICE: Mr. President, multiple times, from your administration, there have come statements that Republicans have no ideas and no solutions. In spite of the fact that we've offered, as demonstrated today, positive solutions to all of the challenges we face, including energy and the economy and health care, specifically in the area of health care -- this bill, H.R.3400, that has more co-sponsors than any health care bill in the House, is a bill that would provide health coverage for all Americans; would correct the significant insurance challenges of affordability and preexisting; would solve the lawsuit abuse issue, which isn't addressed significantly in the other proposals that went through the House and the Senate; would write into law that medical decisions are made between patients and families and doctors; and does all of that without raising taxes by a penny. But my specific question is, what should we tell our constituents who know that Republicans have offered positive solutions to the challenges that Americans face and yet continue to hear out of the administration that we've offered nothing? CONGRESSMAN PRICE: Mr. President, can I -- and I understand that we're not interested in debating this bill, but what should we tell our constituents who know that we've offered these solutions and yet hear from the administration that we have offered nothing. THE PRESIDENT: Let me -- I'm using this as a specific example, so let me answer your question. You asked a question; I want to answer it. It's not enough if you say, for example, that we've offered a health care plan and I look up -- this is just under the section that you've just provided me, or the book that you just provided me -- summary of GOP health care reform bill: The GOP plan will lower health care premiums for American families and small businesses, addressing America's number-one priority for health reform. I mean, that's an idea that we all embrace. But specifically it's got to work. I mean, there's got to be a mechanism in these plans that I can go to an independent health care expert and say, is this something that will actually work, or is it boilerplate? If I'm told, for example, that the solution to dealing with health care costs is tort reform, something that I've said I am willing to work with you on, but the CBO or other experts say to me, at best, this could reduce health care costs relative to where they're growing by a couple of percentage points, or save $5 billion a year, that's what we can score it at, and it will not bend the cost curve long term or reduce premiums significantly -- then you can't make the claim that that's the only thing that we have to do. If we're going to do multi-state insurance so that people can go across state lines, I've got to be able to go to an independent health care expert, Republican or Democrat, who can tell me that this won't result in cherry-picking of the healthiest going to some and the least healthy being worse off. So I am absolutely committed to working with you on these issues, but it can't just be political assertions that aren't substantiated when it comes to the actual details of policy. Because otherwise, we're going to be selling the American people a bill of goods. I mean, the easiest thing for me to do on the health care debate would have been to tell people that what you're going to get is guaranteed health insurance, lower your costs, all the insurance reforms; we're going to lower the costs of Medicare and Medicaid and it won't cost anybody anything. That's great politics, it's just not true. So there's got to be some test of realism in any of these proposals, mine included. I've got to hold myself accountable, and guaranteed the American people will hold themselves -- will hold me accountable if what I'm selling doesn't actually deliver. THE PRESIDENT: I understand that. I've actually read your bills. CONGRESSMAN PRICE: -- throughout 2009. CONGRESSMAN PRICE: And so, rest assured the summary document you received is backed up by precisely the kind of detailed legislation that Speaker Pelosi and your administration have been busy ignoring for 12 months. You know, Mike, I've read your legislation. I mean, I take a look at this stuff -- and the good ideas we take. 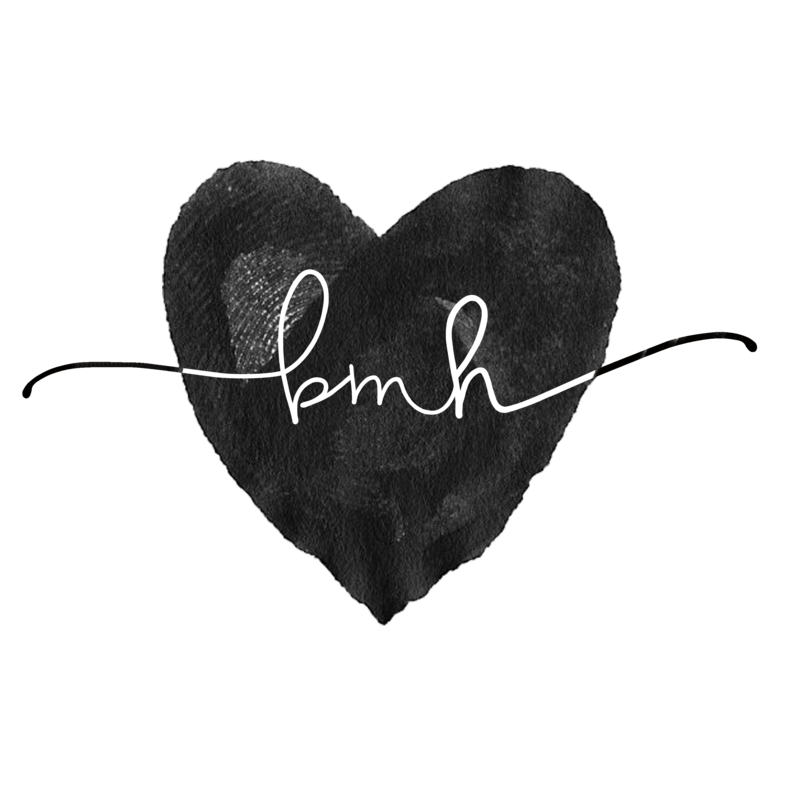 But here's -- here's the thing -- here's the thing that I guess all of us have to be mindful of, it can't be all or nothing, one way or the other. And what I mean by that is this: If we put together a stimulus package in which a third of it are tax cuts that normally you guys would support, and support for states and the unemployed, and helping people stay on COBRA that your governors certainly would support -- Democrat or a Republican; and then you've got some infrastructure, and maybe there's some things in there that you don’t like in terms of infrastructure, or you think the bill should have been $500 billion instead of $700 billion or there's this provision or that provision that you don't like. If there's uniform opposition because the Republican caucus doesn't get 100 percent or 80 percent of what you want, then it's going to be hard to get a deal done. That's because that's not how democracy works. So my hope would be that we can look at some of these component parts of what we're doing and maybe we break some of them up on different policy issues. So if the good congressman from Utah has a particular issue on lobbying reform that he wants to work with us on, we may not able to agree on a comprehensive package on everything but there may be some component parts that we can work on. You may not support our overall jobs package, but if you look at the tax credit that we're proposing for small businesses right now, it is consistent with a lot of what you guys have said in the past. And just the fact that it's my administration that's proposing it shouldn't prevent you from supporting it. That's my point. CONGRESSMAN PENCE: Thank you, Mr. President. Peter Roskam from the great state of Illinois. THE PRESIDENT: Oh, Peter is an old friend of mine. CONGRESSMAN ROSKAM: Hey, Mr. President. THE PRESIDENT: Peter and I have had many debates. THE PRESIDENT: Sure. We worked on it together. CONGRESSMAN ROSKAM: -- negotiated on. You took on ethics reform. You took on some big things. One of the keys was you rolled your sleeves up, you worked with the other party, and ultimately you were able to make the deal. Now, here's an observation. Over the past year, in my view, that attribute hasn't been in full bloom. And by that I mean, you've gotten this subtext of House Republicans that sincerely want to come and be a part of this national conversation toward solutions, but they've really been stiff-armed by Speaker Pelosi. Now, I know you're not in charge of that chamber, but there really is this dynamic of, frankly, being shut out. When John Boehner and Eric Cantor presented last February to you some substantive job creation, our stimulus alternative, the attack machine began to marginalize Eric -- and we can all look at the articles -- as "Mr. No," and there was this pretty dark story, ultimately, that wasn't productive and wasn't within this sort of framework that you're articulating today. So here's the question. Moving forward, I think all of us want to hit the reset button on 2009. How do we move forward? And on the job creation piece in particular, you mentioned Colombia, you mentioned Panama, you mentioned South Korea. Are you willing to work with us, for example, to make sure those FTAs get called, that's no-cost job creation? And ultimately, as you're interacting with world leaders, that's got to put more arrows in your quiver, and that's a very, very powerful tool for us. But the obstacle is, frankly, the politics within the Democratic caucus? Although that's one of the points that I made earlier. I mean, we've got to be careful about what we say about each other sometimes, because it boxes us in in ways that makes it difficult for us to work together, because our constituents start believing us. They don't know sometimes this is just politics what you guys -- or folks on my side do sometimes. So just a tone of civility instead of slash and burn would be helpful. The problem we have sometimes is a media that responds only to slash-and-burn-style politics. You don't get a lot of credit if I say, "You know, I think Paul Ryan is a pretty sincere guy and has a beautiful family." Nobody is going to run that in the newspapers. But on the specifics, I think both sides can take some blame for a sour climate on Capitol Hill. What I can do maybe to help is to try to bring Republican and Democratic leadership together on a more regular basis with me. That's, I think, a failure on my part, is to try to foster better communications even if there's disagreement. And I will try to see if we can do more of that this year. That's on the sort of the general issue. On the specific issue of trade, you're right, there are conflicts within and fissures within the Democratic Party. I suspect there are probably going to be some fissures within the Republican Party, as well. I mean, you know, if you went to some of your constituencies, they'd be pretty suspicious about it, new trade agreements, because the suspicion is somehow they're all one way. So part of what we've been trying to do is to make sure that we're getting the enforcement side of this tight, make sure that if we've got a trade agreement with China or other countries, that they are abiding with it -- they're not stealing our intellectual property or making sure that their non-tariff barriers are lowered even as ours are opened up. And my hope is, is that we can move forward with some of these trade agreements having built some confidence -- not just among particular constituency groups, but among the American people -- that trade is going to be reciprocal; that it's not just going to be a one-way street. You are absolutely right though, Peter, when you say, for example, South Korea is a great ally of ours. I mean, when I visited there, there is no country that is more committed to friendship on a whole range of fronts than South Korea. What is also true is that the European Union is about to sign a trade agreement with South Korea, which means right at the moment when they start opening up their markets, the Europeans might get in there before we do. So we've got to make sure that we seize these opportunities. I will be talking more about trade this year. It's going to have to be trade that combines opening their markets with an enforcement mechanism, as well as just opening up our markets. I think that's something that all of us would agree on. Let's see if we can execute it over the next several years. All right, is that it? CONGRESSMAN PENCE: Jeb Hensarling, Texas. And that will be it, Mr. President. THE PRESIDENT: Jim [sic] is going to wrap things up? CONGRESSMAN HENSARLING: Jeb, Mr. President. CONGRESSMAN HENSARLING: I'm doing well. Mr. President, a year ago I had an opportunity to speak to you about the national debt. And something that you and I have in common is we both have small children. CONGRESSMAN HENSARLING: And I left that conversation really feeling your sincere commitment to ensuring that our children, our nation's children, do not inherit an unconscionable debt. We know that under current law, that government -- the cost of government is due to grow from 20 percent of our economy to 40 percent of our economy, right about the time our children are leaving college and getting that first job. Mr. President, shortly after that conversation a year ago, the Republicans proposed a budget that ensured that government did not grow beyond the historical standard of 20 percent of GDP. It was a budget that actually froze immediately non-defense discretionary spending. It spent $5 trillion less than ultimately what was enacted into law, and unfortunately, I believe that budget was ignored. And since that budget was ignored, what were the old annual deficits under Republicans have now become the monthly deficits under Democrats. The national debt has increased 30 percent. Now, Mr. President, I know you believe -- and I understand the argument, and I respect the view that the spending is necessary due to the recession; many of us believe, frankly, it's part of the problem, not part of the solution. But I understand and I respect your view. But this is what I don't understand, Mr. President. After that discussion, your administration proposed a budget that would triple the national debt over the next 10 years -- surely you don't believe 10 years from now we will still be mired in this recession -- and propose new entitlement spending and move the cost of government to almost 24.5 percent of the economy. THE PRESIDENT: Jeb, I know there's a question in there somewhere, because you're making a whole bunch of assertions, half of which I disagree with, and I'm having to sit here listening to them. At some point I know you're going to let me answer. All right. CONGRESSMAN HENSARLING: That's the question. You are soon to submit a new budget, Mr. President. Will that new budget, like your old budget, triple the national debt and continue to take us down the path of increasing the cost of government to almost 25 percent of our economy? That's the question, Mr. President. THE PRESIDENT: Jeb, with all due respect, I've just got to take this last question as an example of how it's very hard to have the kind of bipartisan work that we're going to do, because the whole question was structured as a talking point for running a campaign. Now, look, let's talk about the budget once again, because I'll go through it with you line by line. The fact of the matter is, is that when we came into office, the deficit was $1.3 trillion. -- $1.3 [trillion.] So when you say that suddenly I've got a monthly budget that is higher than the -- a monthly deficit that's higher than the annual deficit left by the Republicans, that's factually just not true, and you know it's not true. And what is true is that we came in already with a $1.3 trillion deficit before I had passed any law. What is true is we came in with $8 trillion worth of debt over the next decade -- had nothing to do with anything that we had done. It had to do with the fact that in 2000 when there was a budget surplus of $200 billion, you had a Republican administration and a Republican Congress, and we had two tax cuts that weren't paid for. You had a prescription drug plan -- the biggest entitlement plan, by the way, in several decades -- that was passed without it being paid for. You had two wars that were done through supplementals. And then you had $3 trillion projected because of the lost revenue of this recession. That's $8 trillion. Now, we increased it by a trillion dollars because of the spending that we had to make on the stimulus. I am happy to have any independent fact-checker out there take a look at your presentation versus mine in terms of the accuracy of what I just said. Now, going forward, here's the deal. I think, Paul, for example, head of the budget committee, has looked at the budget and has made a serious proposal. I've read it. I can tell you what's in it. And there are some ideas in there that I would agree with, but there are some ideas that we should have a healthy debate about because I don't agree with them. The major driver of our long-term liabilities, everybody here knows, is Medicare and Medicaid and our health care spending. Nothing comes close. Social Security we could probably fix the same way Tip O'Neill and Ronald Reagan sat down together and they could figure something out. That is manageable. Medicare and Medicaid -- massive problem down the road. That's where -- that's going to be what our children have to worry about. THE PRESIDENT: No, I understand. Right, right. Well, look, as I said before, this is an entirely legitimate proposal. The problem is twofold: One is that depending on how it's structured, if recipients are suddenly getting a plan that has their reimbursement rates going like this, but health care costs are still going up like that, then over time the way we're saving money is essentially by capping what they're getting relative to their costs. Now, I just want to point out -- and this brings me to the second problem -- when we made a very modest proposal as part of our package, our health care reform package, to eliminate the subsidies going to insurance companies for Medicare Advantage, we were attacked across the board, by many on your aisle, for slashing Medicare. You remember? We're going to start cutting benefits for seniors. That was the story that was perpetrated out there -- scared the dickens out of a lot of seniors. No, no, but here's my point. If the main question is going to be what do we do about Medicare costs, any proposal that Paul makes will be painted, factually, from the perspective of those who disagree with it, as cutting benefits over the long term. Paul, I don't think you disagree with that, that there is a political vulnerability to doing anything that tinkers with Medicare. And that's probably the biggest savings that are obtained through Paul's plan. And I raise that not because we shouldn't have a series discussion about it. I raise that because we're not going to be able to do anything about any of these entitlements if what we do is characterized, whatever proposals are put out there, as, well, you know, that's -- the other party is being irresponsible; the other party is trying to hurt our senior citizens; that the other party is doing X, Y, Z. That's why I say if we're going to frame these debates in ways that allow us to solve them, then we can't start off by figuring out, A, who's to blame; B, how can we make the American people afraid of the other side. And unfortunately, that's how our politics works right now. And that's how a lot of our discussion works. That's how we start off -- every time somebody speaks in Congress, the first thing they do, they stand up and all the talking points -- I see Frank Luntz up here sitting in the front. He's already polled it, and he said, you know, the way you're really going to -- I've done a focus group and the way we're going to really box in Obama on this one or make Pelosi look bad on that one -- I know, I like Frank, we've had conversations between Frank and I. But that's how we operate. It's all tactics, and it's not solving problems. And so the question is, at what point can we have a serious conversation about Medicare and its long-term liability, or a serious question about -- a serious conversation about Social Security, or a serious conversation about budget and debt in which we're not simply trying to position ourselves politically. That's what I'm committed to doing. We won't agree all the time in getting it done, but I'm committed to doing it. CONGRESSMAN PENCE: Take one more?